Yu Yong said the agreement today was a brand start of future oriented cooperation between HBIS and Langfang and the innovation center will offer new support to the reform and upgrade of HBIS in Langfang. 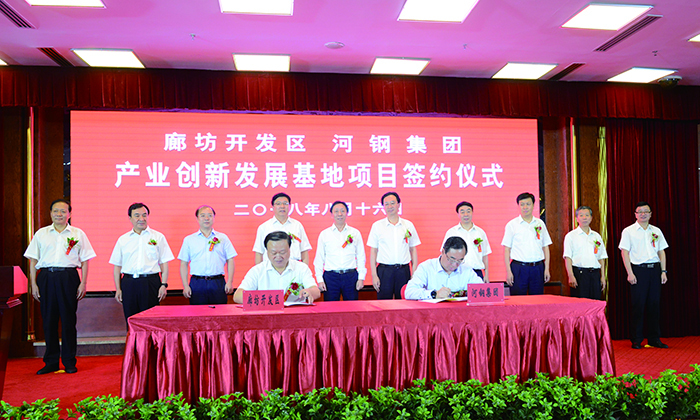 By launching the industrial innovation center, HBIS is firmly following the Hebei Provincial CCP and government policies, which are encouraging the reform and upgrade of steel industry and building a multinational industrial conglomerate. HBIS will steadfastly implement the Xi Jinping new era economic thinking with Chinese characteristics and the decisions of Hebei Provincial CCP and government. HBIS will study the new concepts and the successful experiences of Langfang and strive to the reform and the regional optimization.HBIS will not disappoint Hebei CCP and government. In the future, HBIS will work closely with Langfang people and pursue a better development. Besides high economic benefits, HBIS will mobilize its globalized resources to promote Langfang Brands. Feng Shaohui said that the agreement with HBIS is a mile stone in the reform and upgrade efforts of Langfang. Next, Langfang will be dedicated to support the innovation center projects for their construction, operation and revenues. In the future, HBIS Industrial Innovation Center will be the No.One project of Langfang CCP and government and a designated leaders group will be organized to give comprehensive supports to the projects. With the hard of the both parties, we wish to see the project in operation asap. With the rise of HBIS, the Langfang economic reform the upgrade will also leap forward. The innovation center will have five major functions including industrial technological services, high end material R&D, supply chain financing, overseas businesses and new industry hatching capabilities. The center will develop industrial service oriented new industries to provide growth room for HBIS. The projects will be implemented in different phases and function sectors. The first phase will adopt engineering technology, digital technology, industrial financing and industrial trade. It will be a platform of HBIS developing its high end new industries while giving new energy to economic development of Langfang city.